It was Halloween a few weeks ago and I wanted to make something for the kids that day. However, knowing they were going to come back with more-than-anyone-can-eat candies, I decided to make something "healthier" (like with real butter and real sugar, not corn syrup and fake coloring). 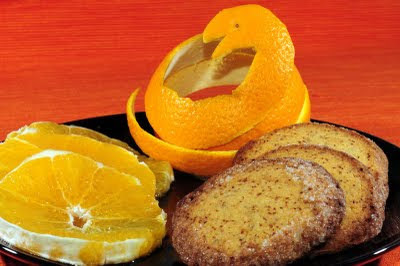 Since Orange was the color of the moment, I came up with the idea of orange-flavored cookies instead of orange-colored cookies. I was looking for orange flavoring at the supermarket and came across The True Orange natural sweetener. I thought to give it a try with a French recipe for Diamond shortbread cookies. In this recipe, the dough is rolled into a log, then rolled in sugar before slicing the cookies and baking them. As a result and with a lot of imagination, the edges of the cookies sparkle like diamonds! We all liked them and the good thing about this recipe is that you can make it all year round! Not just for Halloween! Bon Appétit! In another bowl, mix the flour, the almond meal, and the orange flavor to remove any lump. Cook in the oven for about 12 minutes (when the edges start to brown). I use a food processor to make the dough. If you don't have almond meal, you could finely grind raw almonds. If the almonds still have their skin on, the meal will be brown. I tried to use unrefined cane sugar on the edges of the cookies but if you want to achieve the sparkle of diamonds, it's best to use refined cane sugar. You could keep these cookies in a box in a dry environment. You could flavor them with Vanilla or other natural flavors as well to make a perfect home-made gift for the Holidays. Just make sure the flavor is in a solid form, not liquid. Otherwise, your dough will not have the proper consistency. European style butter has a slightly higher fat content than the traditional American butter. As a result, it has a creamier texture; dough will crisp more.